Objective The National Institute for Health and Care Excellence (NICE) clinical guidelines ‘chest pain of recent onset: assessment and diagnosis’ (update 2016) state CT coronary angiography (CTCA) should be offered as the first-line investigation for patients with stable chest pain. However, the current provision in the UK is unknown. We aimed to evaluate this and estimate the requirements for full implementation of the guidelines including geographical variation. Ancillary aims included surveying the number of CTCA-capable scanners and accredited practitioners in the UK. Methods The number of CTCA scans performed annually was surveyed across the National Health Service (NHS). The number of percutaneous coronary interventions performed for stable angina in the NHS in 2015 was applied to a model based on SCOT-HEART (CTCA in patients with suspected angina due to coronary heart disease: an open-label, parallel-group, multicentre trial) data to estimate the requirement for CTCA, for full guideline implementation. Details of CTCA-capable scanners were obtained from manufacturers and formally accredited practitioner details from professional societies. Results An estimated 42 340 CTCAs are currently performed annually in the UK. We estimate that 350 000 would be required to fully implement the guidelines. 304 CTCA-capable scanners and 198 accredited practitioners were identified. A marked geographical variation between health regions was observed. Conclusions This study provides insight into the scale of increase in the provision of CTCA required to fully implement the updated NICE guidelines. A small specialist workforce and limited number of CTCA-capable scanners may present challenges to service expansion. The recently updated National Institute for Health and Care Excellence (NICE) clinical guidelines ‘chest pain of recent onset: assessment and diagnosis’ (clinical guideline 95, update 2016) state that CT coronary angiography (CTCA) should be offered as the first-line investigation for patients with stable chest pain if clinical assessment indicates typical or atypical angina, or there are ECG changes suggesting underlying coronary artery disease (CAD) in patients with non-anginal chest pain.1 Non-invasive functional imaging (ie, myocardial perfusion scintigraphy (MPS) with single photon emission CT, stress echocardiography, first-pass contrast-enhanced magnetic resonance (MR) perfusion or MRI imaging for stress-induced wall motion abnormalities) is recommended as a second-line investigation if CTCA is equivocal or non-diagnostic. Invasive coronary angiography (ICA) is recommended as a third-line investigation when the results of functional imaging are equivocal. The central aim of our investigation was to assess the current provision of CTCA across the National Health Service (NHS), estimate the requirement if the updated NICE guidelines are fully implemented, and identify geographical variation in delivery and requirement to meet the guidelines. Ancillary aims included identifying the number of CTCA-capable and enabled scanners and formally accredited cardiovascular CT practitioners, both essential components required to deliver the predicted expansion of services. The current service provision of CTCA in the NHS was evaluated in terms of the number of examinations performed per year and was surveyed by different methods in each of the devolved nations of the UK. In England, the number of CTCAs performed by individual providers in the calendar year 2015 was obtained from NHS England electronic records. In Scotland, the number of CTCAs performed in the first 6 months of 2016 was obtained by interrogation of the Scottish National Picture Archiving and Communication System (PACS). In Wales, the Secretary of the Standing Welsh Committee of the Royal College of Radiologists (RCR) collated the number of CTCAs performed in the first 6 months of 2016 by contacting each Welsh centre. In Northern Ireland, the number of CTCAs was obtained from PACS managers at the individual Health & Social Services Trusts using NIPACS. In all cases, the standardised examination SNOMED (Systematized Nomenclature of Medicine) code ‘CACRY’ (419545005), denoting a ‘cardiac-gated CT angiogram’, was used to identify relevant cases. Data from each of the devolved nations were combined to estimate an annual number of CTCAs performed within individual health regions and across the NHS as a whole. There are an estimated 120 000 annual rapid access chest pain clinic (RACPC) attendances in England, as detailed in the resource impact report published with the NICE clinical guidelines.7 This of course does not include Scotland, Northern Ireland and Wales. The majority of these patients may undergo diagnostic testing for stable chest pain8; however, as acknowledged in the report this is likely to underestimate the number of patients that may require CTCA, as it does not account for presentation via other routes such as emergency departments and cross-specialty referrals. Nonetheless, the number of RACPC attendances can be considered very much a conservative ‘lower bound’ estimate of the number of CTCA scans required to implement the new guidelines. According to data published by the British Cardiovascular Intervention Society,9 96 226 PCIs were performed in the NHS in 2015 and 32.4% were performed for stable angina—approximately 31 200. The number of coronary artery bypass graft (CABG) procedures performed specifically for stable angina in the NHS in 2015 is not published to our knowledge, and an estimate was calculated using data from the SCOT-HEART trial. The ‘standard care’ group of the trial observed 201 patients undergo revascularisation, of which 160 underwent PCI and 45 CABG, with a ratio of 3.56:1. Applying this, we estimate that approximately 8760 patients would have undergone CABG out of approximately 39 900 total revascularisations (PCI and CABG) for stable angina in the NHS in 2015. An apparent trend for more revascularisation procedures, with an overall increase of 16%, was observed in the ‘standard care plus CTCA’ compared with the ‘standard care’ group in the SCOT-HEART trial (233 vs 201, with 2073 patients in both groups). Assuming a similar increase in revascularisation procedures with full implementation of the updated NICE guidelines, we estimate that approximately 46 000 revascularisations would be performed for stable chest pain. Again using data from the SCOT-HEART trial, 2073 patients were assigned to the ‘standard care plus CTCA group’, 1778 of which actually underwent CTCA and 233 revascularisation, with a ratio of 7.63:1. Assuming a similar ratio of CTCA:revascularisation with full implementation of the updated NICE guidelines, we estimate that approximately 350 000 CTCA scans would be required per year. A flow chart summarising this model and the calculations is available in an online supplementary file 1. The number and location of ‘64 slice or better’ CT scanners in the UK operated by the NHS in 2016 were acquired from the four major CT manufacturers (General Electric Healthcare, Philips Healthcare, Siemens Healthineers and Toshiba Medical Systems Corporation). Detailed information was requested on the current capabilities of each CT scanner for performing ECG-gated cardiovascular CT and classified as ‘CTCA-capable’ (including those requiring software upgrades) or ‘not CTCA-capable’. More detailed subclassifications of scanner capabilities (the results of which were beyond the scope of this article) are available on the British Society of Cardiovascular Imaging/British Society of Cardiac CT (BSCI/BSCCT) website10 and include ‘currently performing CTCA’; ‘ready to perform CTCA’; ‘not ready to perform CTCA but capable with software upgrade(s)’; and ‘not capable of performing CTCA’. Data obtained on the provision of CTCA at individual centres were used to infer the CTCA capability of scanners when information from manufacturers was incomplete. Furthermore, initial results were disseminated among BSCI/BSCCT members who were invited to submit amendments to the CTCA capability of their local scanners. Anonymised registries of accredited CTCA practitioners in the UK were obtained from the BSCI/BSCCT10 (a society which covers the UK and Ireland) and the international Society of Cardiovascular CT (SCCT)11 (based in North America), detailing level of accreditation (ie, level 2 or level 3) and practitioner location in 2015. Duplicate entries for individuals accredited by both societies were identified and counted only once. To investigate potential geographical variation, individual providers were mapped to 70 individual health regions and the four devolved nations within the UK. The ‘health regions’ employed were the 44 Sustainability and Transformation Plan (STP) footprints in England, the 14 NHS Health Boards in Scotland, the seven Health Boards in Wales and the five Health and Social Care Trusts in Northern Ireland. Results from individual health regions were used to produce red-amber-green maps of the UK to visually highlight geographical variations in CTCA provision. KML (an XML-based language) was used to define the geographical borders of the health regions using Google maps application programming interface to produce interactive maps. Total population sampling was attempted for each geographical area investigated while the data on procedure rates are from other publications; hence, the estimates are purely descriptive and no formal statistical tests of hypotheses have been conducted. Based on our analysis, we observed an annualised rate of 42 340 CTCA examinations in the periods examined in the UK (66 per 100 000 population, per year). As detailed in the methods, we estimate that approximately 350 000 CTCA scans (545 per 100 000 population, per year) would be required per year to fully implement the updated NICE guidelines. The results of current provision and estimated requirement are detailed and compared in table 1 for the UK as a whole and each of the devolved nations. Figure 1 maps the number of CTCA scans per 100 000 population currently performed across health regions in the UK, and figure 2 maps the estimated percentage increase in the number of CTCA scans per year required to implement NICE guidelines. Map of the number CTCA scans per hundred thousand population per year currently performed by health region in the UK (green = 181 to 270; amber = 91 to 180; red = 0 to 90). CTCA, CT coronary angiography. 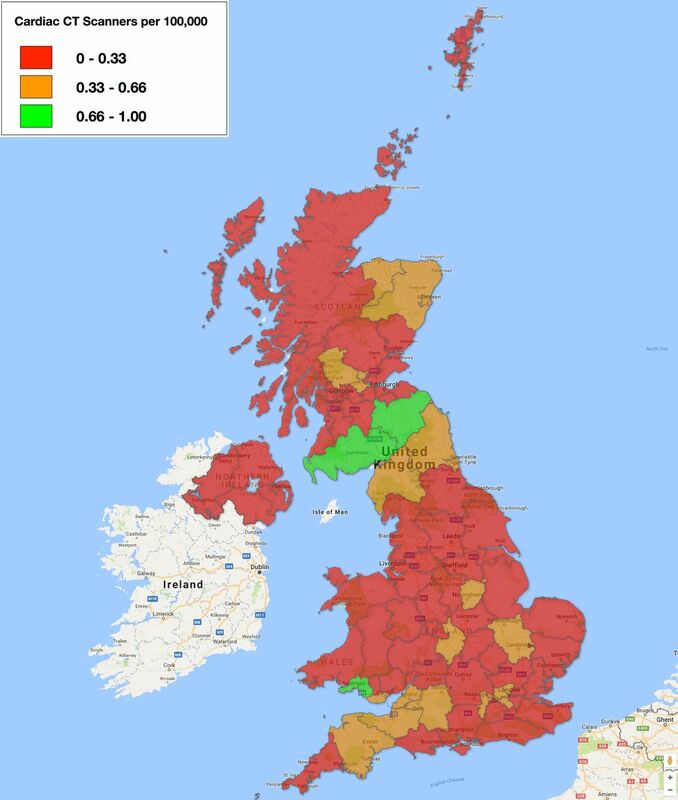 Map of the estimated percentage increase in provision of CT coronary angiography scans required for full implementation of the updated National Institute for Health and Care Excellence guidelines by health region in the UK (green = 0 to 100%; amber = 101 to 5000%; red = 5001 to 16 000%). Table 2 details the results of the 10 ‘highest-volume’ health regions, closest to meeting the estimated provision required for full implementation of updated NICE guidelines. Providing the results of each of the 70 individual health regions in the UK was beyond the scope of this article. In total, 8 of the 70 health regions were identified as currently having no service provision of their own for performing CTCA, including large regions with populations over half a million people (namely, the STP Shropshire, Telford and Wrecken, and the Scottish Health Board NHS Lanarkshire). Three hundred and four CTCA-capable scanners operated by the NHS across the UK as a whole were identified. No CTCA-capable scanners were identified in 7% of health regions (5 out of 70). As stated in the methods, more detailed subclassifications of scanner capabilities are available on the BSCI/BSCCT website.10 Table 3 details and compares the number of CTCA-capable scanners with the estimated CTCA provision required to fully implement the updated NICE guidelines across the UK as a whole and each devolved nation. Figure 3 maps the number of CTCA-capable scanners per million population by health region in the UK. Map of the number of CT coronary angiography-capable scanners per hundred thousand population by health region in the UK (green = 0.66 to 1.00; amber = 0.33 to 0.66; red = 0 to 0.33). There are 198 accredited CTCA practitioners in the UK in 2015 according to the BSCI/BSCCT and SCCT registries, with 169 level 2 and 29 level 3 practitioners. Table 4 details the number of practitioners with comparisons to the estimated CTCA provision required to fully implement the updated NICE guidelines across the UK as a whole and each devolved nation. Figure 4 maps the number of accredited practitioners per million population across health regions in the UK. No accredited CTCA practitioners were identified in 31% of health regions (22 out of 70). Map of the number of accredited practitioners per million population by health region in the UK (green = 10 to 13; amber = 5 to 9; red = 0 to 4). The results provide detailed insight into the scale of increases in the provision of CTCA that would be required to fully implement the recommendations of the updated NICE guidelines. Across the UK as a whole, the number of CTCA scans would need to increase more than eightfold, from approximately 42 340 to 350 000 examinations per year (66 to 545 per 100 000 population, per year). Even by the ‘lower bound’ conservative estimate of all 120 000 annual RACPC attendances in England undergoing CTCA, an increase of more than threefold would be required. Significant geographical variation in CTCA delivery was demonstrated; for example, the devolved nations of Scotland and Wales would require increases of 13-fold and more than 19-fold, respectively. Furthermore, many individual health regions, including several with large populations, currently provide no CTCA service of their own. Even the two ‘highest volume’ health regions for CTCA (North West London and Devon) would need to increase delivery by more than double their current provision. Of note, 4.32 million CT examinations were performed in the UK 2015 ,12 and if the estimated provision of CTCA required had been performed it would have accounted for 1 in 13 (7.6%) of all CT examinations. The rate of expansion of CTCA services will clearly be hindered in many health regions with limited numbers of CTCA-capable scanners and competent practitioners. Radiographers trained and experienced in CTCA have not been surveyed as part of this research but substantial numbers will be critical to expanding high-quality CTCA services at acceptable radiation doses.14 The absence of additional funding to support implementation of the updated guidelines may present a short-term challenge but it should be noted that the NICE resource impact report7 predicts that savings are possible with implementation of the guidelines from year 5 onwards. Centres starting a new CTCA service may benefit from support and close collaboration from established specialist centres and experienced practitioners. While CTCA currently mandates lower reimbursement under the NHS tariff structure than functional and invasive cardiac imaging modalities (ie, MPS with single photon emission CT, stress echocardiography, first-pass contrast-enhanced MR perfusion, MRI for stress-induced wall motion abnormalities and ICA),15 several factors may make CTCA provision more attractive. First, CTCA is quick to perform with greater potential for high-volume throughput compared with the alternative imaging techniques. With higher examination throughput, the profitability of CTCA rises, as the fixed costs remain static. If, as predicted, there are a large number of normal and non-flow-limiting results from within this stable chest pain cohort,7 many individuals can be reassured, avoid further downstream testing and likely discharged following a single consultation. Currently, CTCA is not bundled with the outpatient attendance and therefore is funded in addition to the clinic attendance.15 Organisations funded to deliver cardiovascular care via block contracts may benefit from a reduction in more expensive functional imaging and invasive angiography, increasing their incentive to perform CTCA as a rapid, inexpensive and often conclusive investigation. A potential limitation to the accuracy of the survey of the current provision of CTCA in the UK is the fact that the standardised examination SNOMED code ‘CACRY’ (419545005) used to identify cases from NHS England Returns and the PACS systems of the other devolved nations may include significant numbers of studies not performed primarily for coronary artery assessment in patients presenting with stable chest pain for example, transcatheter aortic valve implantation planning. The results for the current delivery of CTCA may therefore represent an overestimate of the number actually performed within the parameters of the recommendations of the updated NICE guidelines. In contrast, there may be underestimation where the correct codes have not been applied to CTCA examinations. The estimated provision of CTCA required to fully implement the updated NICE guidelines, modelled on data from the SCOT-HEART trial, is based on the largest and most relevant study on a UK population. Our estimate of 545 CTCAs per 100 000 is similar to the estimate published in the recent BSCI/BSCCT response to the updated NICE guidelines (523 CTCAs per 100 000 per year),16 which were based on previously published assumptions used to predict demand for MPS in 2003.17 There are, however, limitations to the external validity of the SCOT-HEART data, based on a population in Scotland, when applied across the UK population as a whole. Potentially significant geographical variations in the incidence of stable chest pain and CAD, as well as rates of different approaches to revascularisation (ratio of PCI to CABG observed in SCOT-HEART used to estimate total number of revascularisations), were not accounted for in the model. Furthermore, the methodological limitations acknowledged in SCOT-HEART (eg, the exclusion of patients over the age of 75 years) and the marginal minority of screened patients actually enrolled (42%) also limit the generalisability of the data. Several inaccuracies were identified in the data related to CTCA capability of scanners submitted by the manufacturers. It is probable that these have only been partly rectified by amendments submitted by BSCI members. A basic limitation of our survey of the specialist workforce includes the fact that not all physicians performing CTCA are formally accredited and conversely not all accredited practitioners are necessarily involved in significant numbers of examinations. The currently limited provision of CTCA in terms of current activity, appropriate hardware and personnel presents a major challenge to the implementation of the NICE guidelines. The delivery of CTCA services is highly variable between health regions and even across the devolved nations within the UK. There are multiple health regions with currently no CTCA service, CTCA-capable scanners or accredited practitioners. Significant investment in new technology, training and experience will be required to accommodate the expansion of high-quality CTCA required. The provision of CT coronary angiography (CTCA) required to implement the recently updated National Institute for Health and Care Excellence clinical guidelines ‘chest pain of recent onset: assessment and diagnosis’ in the UK is unknown. An estimated 42 340 CTCAs are currently performed per year and 350 000 would be required to implement the guidelines. Three hundred and four CTCA-capable scanners and 198 accredited practitioners were identified. A marked variation in provision between health regions was observed. The insight provided by this study into the scale of increases in the provision of CTCA required to implement the guidelines, including appropriate hardware and personnel, is important in planning healthcare delivery. Dr Rachael MacIsaac, University of Glasgow, for statistical advice. National Institute for Health and Care Excellence (NICE). Chest pain of recent onset: assessment and diagnosis. Clinical guideline [CG95]: NICE. (Epub ahead of print Mar 2010). National Institute for Health and Care Excellence (NICE). Resource impact report: Chest pain of recent onset: assessment and diagnosis (CG95). (Epub ahead of print Nov 2016). Society of Cardiovascular Computed Tomography. www.scct.org. NHS Improvement. National tariff payment system 2017/18 and 2018/19. Annex A: The national prices and national tariff workbook. London, UK: NHS Improvement. http://www.improvement.nhs.uk/resources/national-tariff-1719.
. Myocardial perfusion scintigraphy: the evidence: A consensus conference organised by the British Cardiac Society, the British Nuclear Cardiology Society and the British Nuclear Medicine Society, endorsed by the Royal College of Physicians of London and the Royal College of Radiologists. Eur J Nucl Med Mol Imaging 2004;31:261–91. Contributors Study concept and design: JD, EN, CR, SP and GR. Data acquisition: JD, EN, CR and GR. Data analysis: JD, EN and GR. Data interpretation: JD, EN, CR, SP and GR. JD drafted the original report and all authors revised the content of the original and updated manuscript. JD, EN and GR agree to be accountable for all aspects of the work. Data sharing statement Data on the subclassifications of scanner capabilities (the results of which were beyond the scope of this article) are available on the British Society of Cardiovascular Imaging/British Society of Cardiac CT (BSCI/BSCCT) website (www.bsci.org.uk) to BSCI members and include our survey of '64-slice or better CT scanners' in the UK that are: ‘currently performing CTCA’; ‘ready to perform CTCA’; ‘not ready to perform CTCA but capable with software upgrade(s)’; and ‘not capable of performing CTCA’.